To be very honest with you I was preparing myself for what I had been told about the beaches in Nusa Dua (untidy and rubbish in the area). 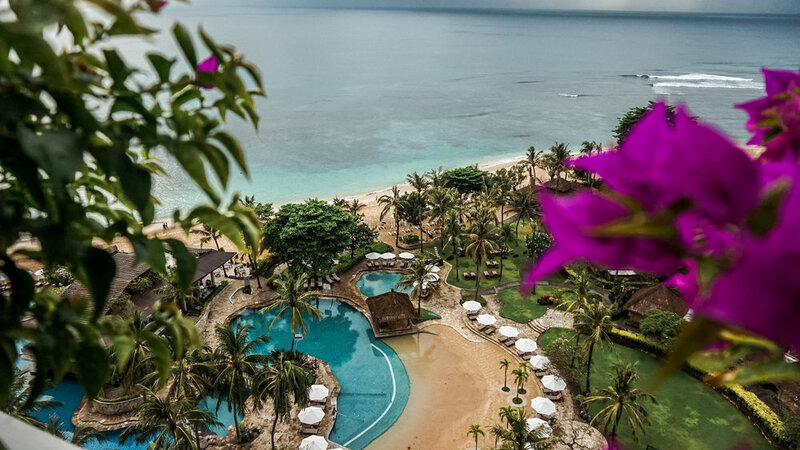 Not the case with Hilton Bali Resort and it may well be because Hilton is located away from all the other resorts (just a guess) with its own private beach, exclusive to resort guests only. The very first thing I research when visiting any destination is the beach/ pool and watersports facilities. I had a feeling that the Hilton beach was going to be different in a good way, and it certainly was. Unfortunately there was a miscommunication with airport transfers at arrival to the airport, however, that was arranged via a third party (i'm going to cover this later in my post). Once we arrived at the hotel we were greeted by our private butler (Adi) who whisked us away via buggy to the villa lounge for check-in which was a seamless experience, with cocktails and canapes on arrival. Veli and I spent most of our 4 days in the villa and around the property given it was our first stop. We were really taking in the full resort experience and left the adventures for other parts of Bali. The villas are only 5 years old and very well appointed with 298 sq. m of exclusive retreat complete with a lush garden with private swimming pool and terrace. Here are some snaps of our 1 bedroom pool villa. As mentioned earlier, the beach here is perfection so on the first morning I woke up at 5:30 am for the sunrise which was just incredible and surprisingly the temperature was quite warm for how early it was, I remember working up a bit of a sweat on the way down. The villas are actually located away from the beach and it takes about 5 minutes to get down there. How gorgeous is this sunrise? The property is HUGE and nestled beautifully on the cliff edge, cascading down to the private beach. 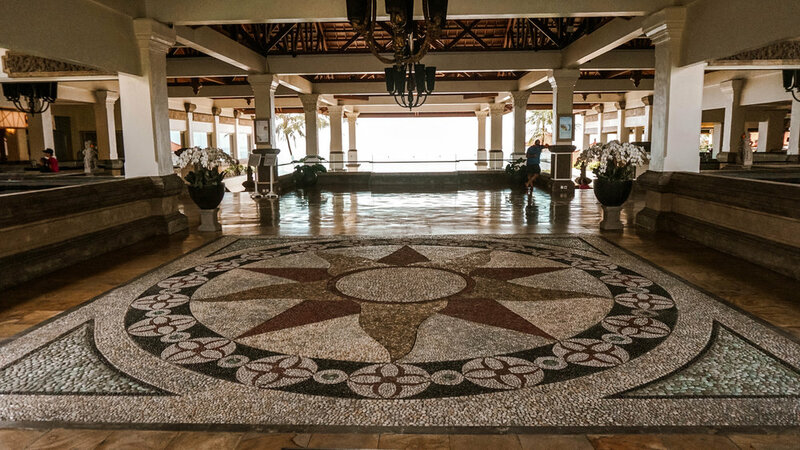 You could literally spend all day down here because there is an oceanfront restaurant & bar with 3 interconnecting pools that will keep you entertained all day. OH and I almost forgot you can also book a camel ride along the beach via Hilton, something I really wanted to do but didn't get around to doing. I should also mention that there are really cute Monkey's that will be hanging around the hotel, and your villa so keep your valuables inside, I think this should go for anywhere in Bali! I've been warned that if it's not locked down they'll attempt to steal it, even the TV if given the opportunity (LOL). These little ratbags are opportunistic! Just look at these cheeky little monkeys. Right after this shot was taken the one on the right was trying to distract us, while the one on the left was slowly creeping its way towards the outdoor buffet where our phones, cameras and laptops were. It attempted to jump over the wall but we managed to scare it off in time. SO CHEEKY! 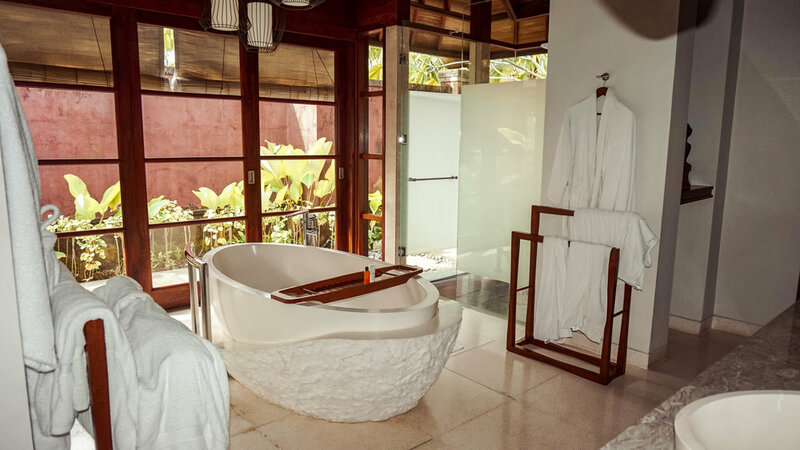 Hilton Bali Resort was recently renovated through part of 2018 and completed renovations in September 2018. I believe the cliff tower/s and lagoon rooms were renovated and also the Executive Lounge (Exclusive members lounge) and a few of the restaurants, including the breakfast hall. The breakfast and dining experience was very good. Breakfast is served for villa guests each morning (À la carte menu) at the Villa Lounge which overlooks the lush green gardens and fish pond, and the villa lounge also puts on daily happy hour drinks and bites between 5 pm & 7 pm, a really nice way to enjoy the evening, particularly after a big day in the sun. Our butler Adi arranged an in-villa BBQ with private chef to serve dinner right by our pool for approx. $300 AUD in total. There was plenty of fresh seafood, fresh vegetables, condiments and drinks. It will be very worthwhile getting yourself some good quality alcohol from duty-free on the way through to enjoy with times like these. 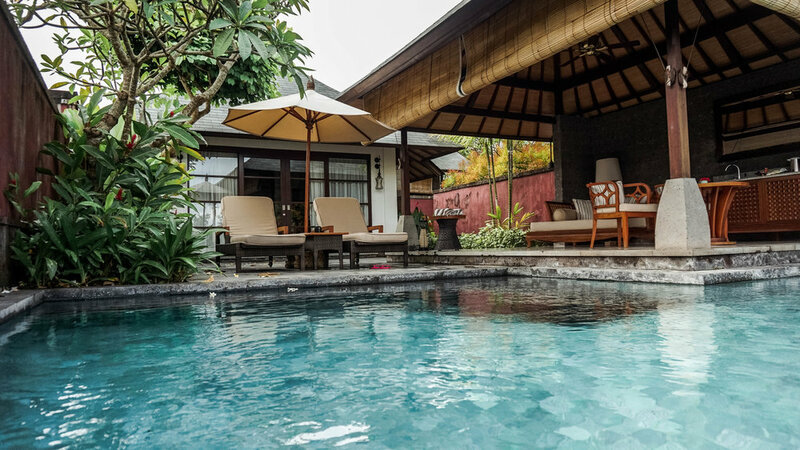 If you can afford to splash out and get a Villa in Bali I'd highly recommend it; the service is far more personalised (speaking from experience) and that goes for both boutique villa only establishments and large hotel chains. I've stayed with Hilton many times before and I can say that each time my experience has been equally consistent, it makes the world of a difference when it comes to being a loyal customer. I am a Diamond Hilton Honors member which will make a slight difference in service experience, however even well before that Hilton has always been strong on their customer service. If you are not loyal to a particular brand I suggest signing yourself up immediately. The benefits far outweigh not being a loyalty or rewards member, particularly if you travel even a few times per year. Now, watch this space because I will be doing a write up on my experience with loyalty & rewards programs soon. Entry to the Hilton Bali Resort - the prettiest hotel entrance ever! Nusa Dua is a place where you unwind and soak up the sun by the water. There is not a heap of adventurous things to do in this area, however, there is a really cool local shopping centre called Bali Collection which is similar to Duty-Free shopping combined with local markets, and fantastic restaurants... I really loved it and ended up here twice, the shopping was great. Its located near all the major resorts within a similar layout to a large gated community. Click here for more on Bali Collection. We were fortunate enough to be invited to inspect the 3 bedroom family villa at the Hilton which I will certainly be taking into consideration for our next family holiday, the villa was HUGE with kitchen, dining and living areas and massive back garden and private lap pool with bungalows. Would love my sisters to come with me next time to this amazing resort. Click here to see more of the 3 bedroom family pool villa. I would really love to make mention of 3 particular Hilton employees who made us feel like royalty; Adi our private butler, Eka and Yeni who both work in the villa lounge. Thank - you so much for your commitment to making us feel so special! 1. Booking confirmations/ communication; We had a little hiccup on arrival to the airport, our driver was not there to pick us up. This is only because I was liaising with a 3rd party who took over the communications from the resort and I had assumed that a car had been booked. Make sure you always get written confirmation of bookings that way you'll avoid any miscommunication or misunderstanding. 2. Currency exchange; Never exchange your currency for IDR at the airport (origin or destination) or in any popular tourist areas. This was our 3rd time to Bali and we've learned to leave this until physically in the outer suburbs and less popular areas. The exchange rate is far better and you'll avoid ridiculous exchange fees like what you see at the airport. 3. Water; very simple - DO NOT DRINK THE WATER....even use bottled water to brush your teeth. I am so surprised that I have never been ill in Bali. I've travelled to Turkey, the Philippines and Thailand and got ill, but not in Bali. It's far more in tune and advanced in favour of westerners. THANK - YOU for stopping by and I hope you enjoyed the read, please comment below with any questions, feedback or even if you just want to say hey. This resort makes me so happy and I hope you consider it when visiting Bali. Hilton Bali Resort - you make me so happy!